“Economics is exciting,” declared Mr Garnett. That’s about all I remember about my fi rst economics teacher, apart from his tales of “those grotty little nightclubs in Liverpool”. Economics is exciting; exciting because it’s not about money or business, it’s about people. It’s the study of madness of crowds, their frothy exuberance and their hand-wringing despair. Hawke’s Bay is enjoying an economic renaissance, or so it seems. Many prices for houses and rural land are up 30-40% on what would have been expected a year ago, with startlingly strong sales making newspaper headlines. “I don’t know what anything’s worth,” says Colliers agent Louise Wake. The market has been hot before, but never has it happened so quickly. We have the highest retail sales growth and are ranked 3rd in the ASB’s Regional Economic Scoreboard, behind only BOP and Auckland. The rural industries that drive our province are all doing somewhere between OK and very well. It’s not often that sheep, beef, apples, cropping and wine have all been simultaneously profitable. It’s great to feel the positive energy out there, but it’s also a good time to consider the lessons of history. Economics is a tale of booms, periods of consolidation and the occasional bust. The economy moves in ‘business cycles’ that change like the seasons. The idea of economic seasons was popularised by Russian economist Nikolai Kondratiev in the 1920s. Before Stalin had him executed, Kondratiev talked about the economic seasons of spring, summer, autumn and winter. It’s a great way to remind ourselves that the future will not be like the present. A strange quirk of human nature is that we are easy lured into believing that if the economy is good, it will be good forever, and if the economy is bad, it will be bad forever. Primary industries in Hawke’s Bay and across New Zealand show us clearly that is not the case. Most notable right now are the woes of the dairy industry. In three short years the Whole Milk Powder prices have fallen from just over US$5000/T to just over US$2000/T. Record breaking prosperity caused the dairy industry here to ramp up production. The only problem was that producers in other countries also like the idea of loads of cash sloshing around in their bank accounts and also started to produce more. This downturn might be worse than most, but the dairy industry has seen plenty before. Another industry making headlines is kiwifruit, with returns for the new G3 ‘Sungold’ variety of up to $70,000/hectare, driving orchard prices to more than $500,000/ hectare. “The land prices are justified by the earnings,” a banker recently told me. The only problem with this argument is that the earnings haven’t proved reliable in the past. The kiwifruit industry had a very rough time in the 1980s as production grew rapidly and exporters undercut each other in the marketplace. The kiwifruit marketing board, now Zespri, was established to fix this problem, but it too was on the precipice of bankruptcy by 1992. They overpaid the growers and ended up owing the banks $80 million and creditors $20 million. Those were big numbers a generation ago. And fi nally the virulent bacterial disease all but wiped out the production of Zespri Gold kiwifruit just fi ve years ago. Our local apple industry has had similarly tough times. It seems inconceivable now, but land prices on the Heretaunga Plains halved in the late 1980s. The depths of the ‘correction’, around 1988, reflected difficult marketing conditions, but also a notable weather event called Cyclone Bola. The apple industry enjoyed a euphoric recovery in the early 1990s as Braeburn and Royal Gala enjoyed their best years. The devastating and widespread hailstorm of 1994 was followed by a series of difficult markets and by the late 1990s – you guessed it – land prices halved again. It’s a reminder that above all else, rural producers have the roof off the factory and we’re an island in the Pacific. Don’t bank on eternal prosperity and don’t rule out the possibility that land prices might halve again. Of course people don’t like the reality of a downturn and cry out to government ‘fix it please!’ That sounded very appealing to politicians because poor economic conditions so often result in a change of government. Since WWII the developed world has applied the theories of John Maynard Keynes to try to achieve steady, sustainable economic growth. Keynes’ dominant idea was that a government could do things to stimulate the economy in difficult times and to slow it down when things were getting too hot. Essentially we’d get rid of the troublesome seasons and live year-round in an economic balmy Bahamas. It’s a nice theory, but governments are guilty of some fairly naïve interventions. They have a fair record of stimulating floundering economies, but an absolutely appalling one when it comes to dampening down economic booms. What politician wants to call an end to the party? Rather than eliminating economic cycles, politicians just kick the can down the road. For a long time this gives the guise of stability, but I suspect when the economic winter finally arrives, it will be an ice age. A few years ago, while visiting Yosemite National Park, I read the flier about forest fires. For years park rangers tried to prevent fires entirely, but this led to a build-up of undergrowth. When the fire finally came it was an uncontainable beast and caused vast destruction. Now they allow fires to occur and even start a few of their own. Forest fires clean out the cluttered undergrowth and provide nature with a blank canvas on which to start again. The green shoots emerge rapidly. Keynes would have been a fire starter. The economic winter is the time when ‘Mr Market’ deals with the excesses and malinvestment that happens in boom times. ‘Mr Market’ is brutal, but the pain is over quickly enough, if he’s allowed to do his work. Current prosperity isn’t actually fuelled by businesses making money. Sure, that’s helpful, but migration and capital infl ows are probably providing much of the impetus. 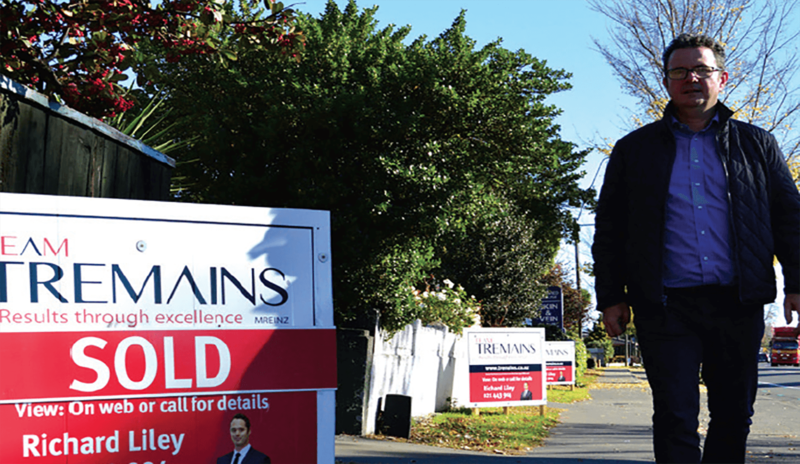 More people and more money will force up asset prices, as we’ve seen in Auckland. On this basis I’m not sure the current economic euphoria is misplaced. It could be that these two factors go our way for the next 20 years – there sure are a lot of Chinese that fancy living here. While we’re enjoying prosperous times here in Hawke’s Bay, the rest of the world isn’t doing so well. US government debt is off the chart and they look like they might elect Donald Trump as president. Europe is facing a potential Brexit and Grexit as Britain and Greece either bail out or get kicked out. Much of the rest of Europe is suffocating under a debt load they can’t possibly hope to repay. Even our economic heroes in Asia are experiencing a slowdown; they’re off the milk and back on the rice. There is a whole lot of potential trouble out there and in a more globally synchronised world we might just all go down together. No one can see the future, but it’s time for a dash of caution perhaps. Don’t take my word for it. Look at the most successful investors in the world and what they are up to. Plenty of them are bearish. George Soros is one of the best. I don’t want to perpetuate any racial stereotypes here, but he’s an 85-year-old, Jewish- Hungarian with more than $30 billion dollars to his name. He’s good with money. Soros is predicting a ‘hard landing’ for the Chinese economy and deflationary pressures around the world. He’s invested heavily in a gold mining company and the barbarous relic itself. Gold is completely useless unless you want a new pair of earrings or the economy is in danger of collapsing. I’ll give the last word to US billionare Warren Buffet, who has about $95 billion more than I do. The Oracle of Omaha says it quite simply: “Be fearful when others are greedy and greedy when others are fearful.” That’s about the best economic advice you’ll ever get. Paul Paynter is our resident iconoclast and cider maker. Sometimes he grows stuff at Yummyfruit.